When the Gracies’ 1st cultivated Brazilian Jiu Jitsu did they ever think it would reach as far as it has? The art can now be found in almost every country around the globe including far off places like Kazikstan. Although Jiu jitsu wasn’t introduced in Kazakhstan until 2008, it is growing fast. It should come as no surprise that in a country known for having conservative and traditional gender roles it is much less common to find women training. However a few brave women have stood up against the adversary and are leading the way for generations to come. Meet Aigerim Toleukhanova- she is a 24-year-old blue belt training in London at Roger Gracie’s Academy. What makes her story interesting is that she is part of the jiu jitsu movement in her country, which is Kazakhstan. 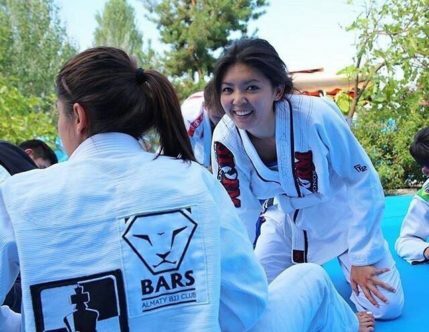 Aigerim originally started training jiu jitsu in her hometown of Almaty, Kazakhstan, at Checkmat Academy, just 4 years ago in 2014. When Aigerim began training, the highest ranking student in her country was a purple belt. It was Aigerim’s coach, Mr. Bek Ali Yerzha, who first introduced jiu jitsu to her. When Aigerim’s female friend from the university invited her to jiu jitsu class, she was excited that another female trained, and she took her first no gi class. “I think what made me interested in jiu jitsu is that I did not understand anything. I did not understand how I could defend myself from a choke, why I got swept, etc., so it was a pure curiosity,” she said. The classes for women were free at that time, in hopes of promoting the sport among women. The next thing Aigerim remembers is that she found herself training every day. And it wasn’t always easy. Some people in Kazakhstan believe jiu jitsu is not a sport for women. But Aigerim loved jiu jitsu, her father was proud of her training, and she wasn’t going to let other’s perceptions stop her. What drew her to jiu jitsu is the saying, “jiu jitsu para mulheres” or jiu jitsu for everyone! Aigerim said she recently became a fan of the Bruce Lee podcast where they talk about body awareness. In 2015, Aigerim’s coach, Bek Ali, affiliated his school with Leo Vieira and Checkmat. There was a wave of promotions in Kazakhstan and a few people received their brown belts, including Ali. A year later, Aigerim received her blue belt. Currently, Aigerim lives in London, while getting her master’s degree in media and communications at London School of Economics, where she won a UK government (Chevening) scholarship. And this year has been challenging while trying to balance her studies at the world’s top university, while also volunteering, training and having a social life. Yet Aigerim has competed more this year than she has at any other time in her life. She said she always feels nervous to compete, but the more she does it, the better she gets at it. While jiu jitsu is something Aigerim fits in to her schedule around her free time, her main focus is on her studies. London School of Economics and Political Science is ranked 2nd in the world after Harvard in social sciences. Before attending LSE, Aigerim completed her first master’s degree in International Journalism back home in Kazakhstan, in KIMEP University in 2017. As an undergraduate student, she also studied journalism and won the US Department of State’s fellowship Global UGRAD that allowed her to study one semester in an American university. She studied journalism in Troy University, in Alabama in 2013. Not only has Aigerim received scholarships for her studies, but she also won a scholarship through Girls in Gis in 2018. She chose to use her scholarship money to compete at the European No Gi championship in Rome, Italy. Aigerim said she would like Girls in Gis to know that she is grateful and determined to continue this beautiful journey of exploring herself and this gentle art. She is especially happy that we have this community of women where we can share our thoughts, experiences and other things in this male-dominated sport. “I believe I have converted about a dozen people into jiu jitsu and I hope that more women will join this amazing sport,” she said. There are plenty of stories about women training jiu jitsu in Kazakhstan and people not liking it, but Aigerim said she prefers to focus on a positive side. “I do hope that soon we will come to the stage when women can openly do what they love, pursue their goals and dreams without sacrificing some things for the other because of societal pressure and stereotypes”. Aigerim is an example to follow and inspiration for ladies training in Kazakhstan and Central Asia. Thank you for wonderful interview.